An Ophiuchus’s base land speed is 30 feet. Poison (EX): Ophiuchus' has a poisonous bite that deals initial and secondary damage of 1d4 Con. Natural Weapons (Ex): A Ophiuchus's fangs can be used in a bite attack to deliver poison. 1d6 Piercing, 1d8 Piercing when Large Sized. Improved Grab (EX): To use this ability, a Ophichius must hit an opponent up to the same size category or smaller with it's natural weapon. It can then attempt to start a grapple as a free action without provoking an attack of opportunity. If it wins the grapple check, it it establishes a hold and can attempt to constrict the opponent or swallow the opponent in the following round.. . Swallow Whole (EX): A Ophiuchus can try to swallow a grabbed opponent of up to one size category smaller by making a successful grapple check. Once inside, the opponent takes 1d6+str (which increases to 1d8 at hd 10) modifier points of crushing damage plus 1d6 points of acid damage per round from the Ophiuchus' digestive juices. A swallowed creature can cut its way out by dealing 25 points of damage to the Ophicius’ digestive tract (AC 10 + 1/2 Nat AC). Once the creature exits, muscular action closes the hole; another swallowed opponent must cut its own way out. A Ophicius' gullet can hold 1 small, 4 tiny or smaller creatures . This increases to : 1 medium, 4 small, 8 tiny or smaller creatures when a Ophiuchus grows to large size at HD 10. Constrict (EX): A Ophichus deals 1d6+str modifier of damage with a successful grapple check. This increases to 1d8+str modifier when a Ophichus grows to large size at lvl 10 . Large Size: //Upon reaching the 10th HD, Ophiuchus grows to large size, shedding it's skin. The Ophiuchus gains all bonuses and penalties that come with being large sized. 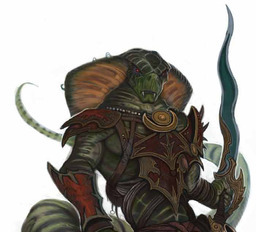 Unnatural Shape: An Ophiuchus must pay the cost for armor as though they were a size category larger than themselves to sufficiently cover their bodies for protective purposes. As a Non-humanoid creature, that cost must also be paid. Natural armor bonus: +2+(2 / 5 HD). Automatic Languages: Draconic, Bonus Languages: Common, Elven.